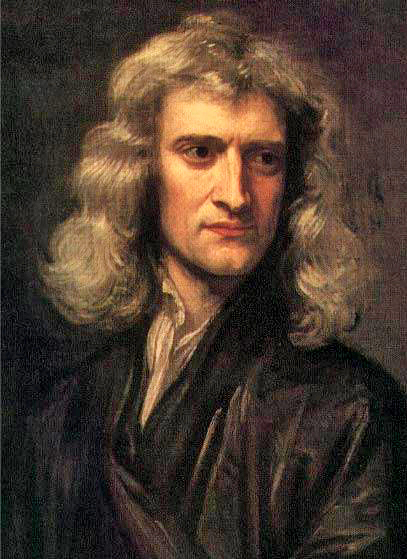 Sir Isaac Newton. Painted by G Kneller 1689. If $p=0$ we say that P is stationary or at rest in the F-frame. Alternatively, if $p \ne 0$ then we say that P is in motion. Sensory interpretation: The momentum is defined by a difference between the wavevector of P and a scaled-down version of the frame's wavevector. Recall that the wavevector has previously been interpreted as a mathematical representation of somatic and visual sensation. So momentum is like the audio-visual contrast between a particle and its reference frame. A signal for attention! Next step: conservation of momentum. Velocity Momentum is traditionaly understood as a product of the mass and a velocity. You can jump ahead to a discussion about velocity to see how the customary approach works with the WikiMechanics definition of momentum given above.